In order to secure loans outside the banking system, Rapid Wien invited fans to invest in the club with a 2-3% return. And already nearly €500,000 are secured! 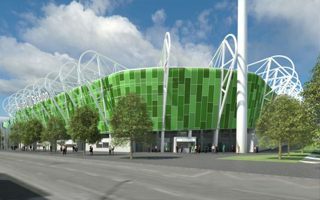 New stadium under construction by Rapid Wien is getting built in record time, but is also the most expensive project ever taken up by the club. With budget at some €50 million (€55m), it’s mostly covered by loans from banks. Financial burden is lowered by naming rights deal with Allianz, but Rapid are seeking new options to make it even smaller. that’s why a crowdfunding campaign was launched in mid-November, officially announced this week. Individual fans of Rapid are encouraged to donate the money needed. “Donate” might not be the best word, because the project is actually an investment opportunity. Depending on period selected by individual investors, Rapid will pay back all the money in 5, 7 or 9 years. At the same time the club will pay annual interest rates to all donors of, respectively, 2%, 2.5% and 3%. The campaign has its risks as the amount of money paid by Rapid to fans will be dependent on financial and sporting form of the club. However we can hardly see this as discouraging, because only during the time it took to write this piece, Rapid’s account grew by over €20,000. While one can invest as little as €100, most investors are putting in much, much more. The register shows 232 people already invested €421,500 people.